As the person in charge of streamlining school bus routes to be more orderly and cost-effective, you know that manual scheduling isn’t getting the job done. 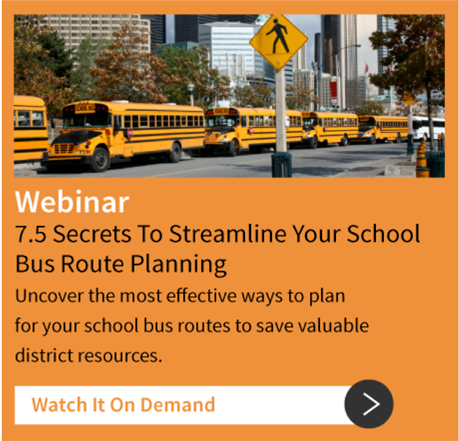 When it takes weeks or even months to manually schedule bus routes for the year, the whole process becomes a costly endeavor because you lack the data-insight to make smart, informed decisions quickly. That’s why our school bus software features a SmartRoute Dashboard: your personalized, real-time software interface for viewing and assessing critical information in one easy-to-read format. With SmartRoute Dashboard, you get real-time data to more easily manage daily operations and plan routes more efficiently on an ongoing basis. By way of our SafeRoute Planning system, you receive updated information on your dashboard regarding student safety. When a parent calls wondering where their child is, you always have an answer ready. Your SmartRoute Dashboard incorporates GPS tracking software data for current location updates. This way, you know the precise whereabouts of every student and when a bus has gone off route or is experiencing extended idle times. The SmartRoute Dashboard is customizable so you may include any combination of applications that suit the specific needs of your school bus route management. The more applications you select for your bus software, the more data you have at your fingertips. With our software’s dashboard, it’s easy to monitor the major functions needed to manage your school bus routes.